Michael L. Aaronson Nephrologist (Kidney Doctor) and Hypertension (High Blood Pressure) Specialist: Improving Communication by Increasing the Signal to Noise Ratio in Electronic Medical Records. How Patients Can Help the Process. In my opinion, we have a long way to go. The figure above shows a patient's assessment and plan written in cursive. It clearly shows the patient's problems and what the plan is going to be. Although simple, the meaning is crystal clear. If such ease were possible in the new world order of electronic health care record keeping, we would surely be #blessed. Unfortunately, many computer electronic medical records have become so complex that the noise, the comprehensive detailed data that really doesn't contribute that much to the patient's health, overwhelms the meaningful data and creates confusion rather than clarity. Some have suggested it's likely trying to find a needle in a haystack. 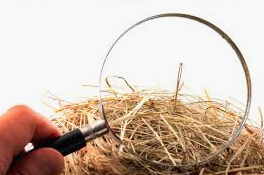 Looking for the needle in a haystack or that bit of health information that really matters to the patient amongst all the unimportant accompanying data. Don't believe me? Just ask the doctors who are retiring in droves because of the complexity of this task. In order to help the situation, I have spent some time trying to simplify some of the processes so that we can improve the signal to noise ratio in the electronic medical record using an untapped resource that is interested in helping -- the patient. I think the health system should incorporate the patient as much as possible in this process to improve the care of the patient and the communication amongst all. If possible make sure you subscribe to the patient's online portal. Different provider's offices call it by different names. It is simply a way for you to access your latest information which most importantly includes your medications and your most recent labs. 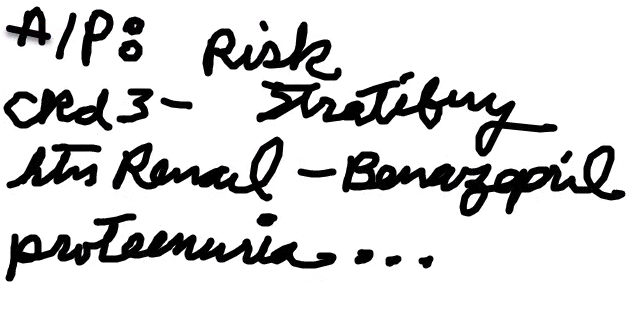 Some doctors give access to their latest notes as well. Let me share an example of how this service might help. If your primary doctor in good faith checked blood and urine just prior to your visit with nephrology and did not send the results to us yet, the information we need to make an informed decision is not available. So until we receive the blood test results, we have to wait to make decisions. If you have access to the patient portal, you can pull up the laboratory results on your phone, on the spot at the appointment, and make them available for our review. I see patients from all over the region. There are times when a lab got delayed a few hours. This tip I share has provided a point of care solution many times for me and the patients I serve. This "trick" should work for you. Another strategy if you don't have access to a patient portal is to have your most recent laboratory (lab) results given to you in person. You may request a copy at the time of the visit with your primary provider. You may request a copy prior to your visit with your kidney doctor so you can have a paper copy to bring with you. Some patients drop by their doctor's office. Others have requested a copy via mail or fax. I have also seen patients call their primary care office and ask the nurse what the most recent creatinine, gfr, and other lab tests are if there is no other way to get the results in time for their appointment. Another suggestion: When you are confirming your appointment at the specialist's office, and you know you have had recent labs done elsewhere, consider asking if the office has received the results. We would like to make sure everything is ready for your visit. If the results are pending, consider the above suggestions. At the end of a visit, I like to give the patient my latest note, printed for the person to read. Consider taking this with you to your next doctor's appointment. Although primary providers send their notes to the patient care team (the specialists) and vice versa, there are times when the messages do not get received. I like redundancy. More is better. I suggest to my patients that they take the after-visit summary which includes my note to their primary provider and other doctors so that they all have access to the assessment and plan. This strategy is point of care perfection because the information if not present all of sudden becomes available and allows for excellent care. Medical records have errors. Electronic records have created a new set of problems. I like to share my notes with the patients I serve. This helps with accuracy as well as improves communication. If a mistake is inadvertently made, a quick email through the patient portal, or a call to the office, can correct an error. This maneuver improves the signal to noise ratio by definition. Moreover, if there is confusion regarding a particular part of the assessment and plan, we can try to clarify it for you. As times change we may update this article with more suggestions to help with improving the process. Consider bookmarking and returning from time to time.